I have a question about Heirloom tomato crosses. And about how pure a particular variety might be. I planted a group of tomatoes out on my little pier, including Fantastic, Amos Coli, Brandywine, Lush Queen, and Better Boy--pretty much one plant of each variety in this group. Each plant was in its own large container, and now only the Brandywine remains, and is loaded with fruit. This plant early on produced some nice large tomatoes like BWs can do. Now the new fruit, which is abundant, is good sized but smaller, and has some striping similar to the Lush Queen--which was a plant next to it. So, can they cross? Am I developing a new heirloom = Lush Wine or Brandy Queen? I will get some pictures. Cross pollenisation this year, won't show until next year. Smaller fruit letter on in the season is pretty common. 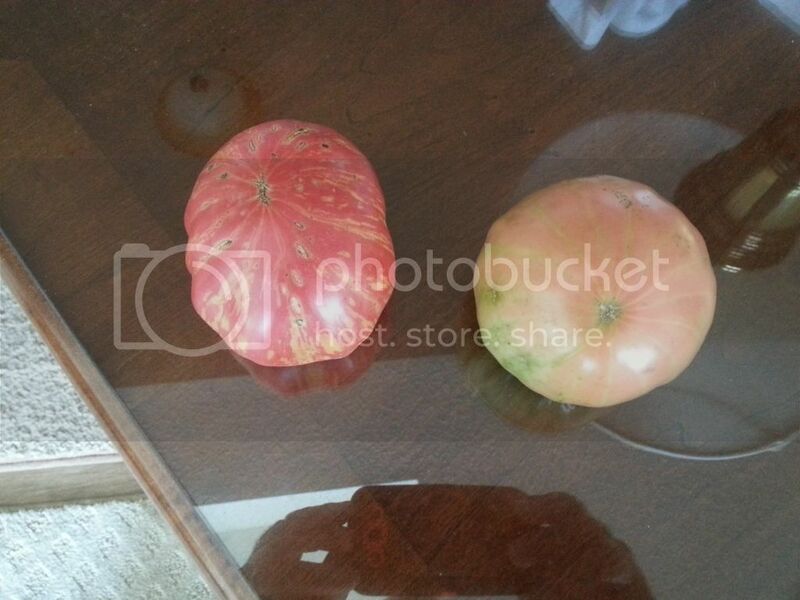 I have yet to see a tomato with two distinct type of fruit. Do you suppose you might have had a Lush Queen volunteer grow up inside the Brandywine cage? applestar wrote: Do you suppose you might have had a Lush Queen volunteer grow up inside the Brandywine cage? It is the same plant, and has lots of fruit. I plan to save some seed from it because it is doing so well, when others have bit the dust. I will get some pictures. I my just be seeing stripes that are not there. OK, so here is a picture of one of the Brandywine tomatoes alongside a Lush Queen. I wish they were at the same stage of ripe, but best I could do. The BW is certainly smaller than the plant's first fruit this year and has some striping, but not as close to the LQ as I once thought. if you save the seed you may have a hybrid. Hybrids are not stable so like a box of chocolates you never know what you get. You only get an heirloom if you are able to grow it in isolation to preven cross pollination and the seeds come true over many generations. Most plants are not heirlooms until the cultivar is at least 50 years old.